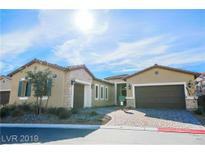 Below you can view all the homes for sale in the Tuscan Cliffs At Southern Highlands subdivision located in Las Vegas Nevada. Listings in Tuscan Cliffs At Southern Highlands are updated daily from data we receive from the Las Vegas multiple listing service. To learn more about any of these homes or to receive custom notifications when a new property is listed for sale in Tuscan Cliffs At Southern Highlands, give us a call at 702-323-5933. Heated pool & spa with waterfall, koi pond. 5 car garage. MLS#2085061. Realty ONE Group, Inc. Featured On A Popular Renovation Series As An “inspiration Home”. MLS#2067988. Pivot Modern, LLC. Large great room w/ wet bar, multi-slide glass door that open to the covered loggia for indoor/outdoor entertainment, gourmet kitchen w/ an island & breakfast bar, quartz countertops, custom cabinetry & GE Profile SS appl, spacious master suite w/ retreat & bath. MLS#2064227. Southern Highlands Realty Corp. Fully finished backyard, with a covered patio, outdoor fireplace, pool & spa. MLS#2055224. Easy Street Realty Las Vegas. Enormous family room upstairs boasts a full bar & expansive balcony overlooking a stunning backyard w/pool, spa & covered patio. MLS#2047371. Huntington & Ellis, A Real Est. Pocket doors in family room open to amazing backyard w/patio & fireplace, outdoor kitchen, pool/spa & so much more! MLS#2045875. Simply Vegas. Elegant living room, multi-slide doors that opens to the bkyd covered patio & interior courtyard. MLS#2036484. Southern Highlands Realty Corp.